A few weeks ago, director JJ Abrams announced at the Star Trek Beyond Fan Event that Paramount and CBS intend to drop their copyright lawsuit against the creators of the Kickstarter-funded fan-film Axanar. Set 21 years before the first episode of the original Star Trek series, Axanar tells the story of legendary Starfleet captain Garth of Izar, one of James T. Kirk’s heroes. The lawsuit raised numerous interesting and important issues about fan fiction. According to the lawsuit, Axanar infringed “innumerable copyrighted elements” of the Star Trek movies and television shows protected under copyrights owned by Paramount and CBS. This allegation was made even though no movie had been even made yet, and the accusations were being raised against huge fans who probably spend a lot of money on Star Trek stuff. The lawsuit created a litigation Kobayashi Maru. A loss could create precedent with far-reaching consequences for Paramount and CBS, while a victory would yield insignificant monetary relief that would likely be outweighed by hurting a huge fan base. Pursuing a case under such circumstances would have been…illogical. What did the complaint really say? It presented a wide selection of Star Trek copyrights from movies and television shows. 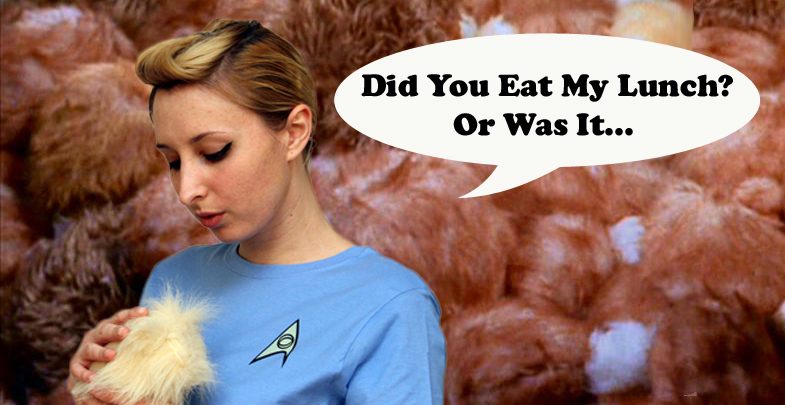 Because the Defendants had to figuratively identify the one Tribble who ate Kirk’s lunch out of 1,771,561 Tribbles, Defendants’ motion to dismiss argued that plaintiffs’ complaint failed to state a plausible claim for relief . As Spock once commented, “Insufficient facts always invite danger.” Space Seed, Star Trek, Season 1, Episode 24 (1968). The court denied defendants’ motion, reasoning that the complaint provides notice of infringement of at least two protectable elements. 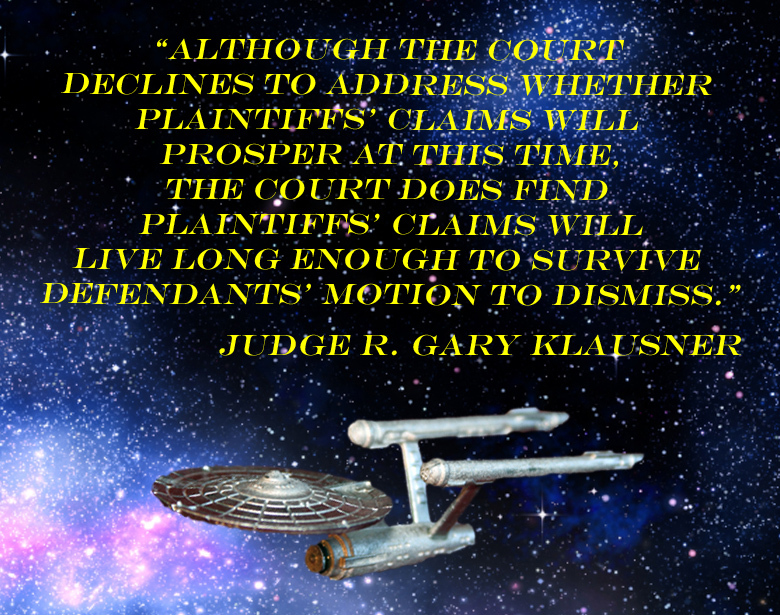 Specifically, the court pointed to the complaint’s allegations regarding Axanar’s copying of the U.S.S. Starship Enterprise and everyone’s favorite Vulcan diplomat, Ambassador Soval. But these were just images in a much bigger show/movie. And they weren’t a central part of the storyline in the teaser video for Axanar. The Judge’s order missed the fundamental point of defendants’ motion: defendants don’t really know what plaintiffs allege has been infringed because plaintiff’s complaint alleges infringement of over 1,000 copyrights and does not identify all of the specific copyrighted elements at issue. Indeed, it made a claim not even knowing what was really being used, if anything. Imagine a trademark or patent plaintiff filing a complaint alleging infringement of “innumerable” trademarks or patents—that wouldn’t fly. Though unsuccessful, defendants’ motion to dismiss previewed thorny copyright issues that Paramount and CBS would have had to navigate in order to emerge victorious and may have helped plaintiffs decide not to pursue the case. For example, the characters identified in plaintiffs’ complaint present a dubious case for protection. Under the Ninth Circuit’s (that area covers California), there is a three-part test for character copyrightability: (1) the character must generally have “physical as well as conceptual qualities;” (2) the character must be “sufficiently delineated” to be recognizable as the same character whenever it appears; and (3) the character must be “especially distinctive” and must contain “unique elements of expression.” DC Comics v. Towle, 802 F.3d 1012, 1019-1020 (9th Cir. 2015) (citation omitted). According to the complaint, Axanar’s protagonist, Garth of Izar, appeared in one episode during the third season of the original Star Trek television series, entitled Whom the Gods Destroy. In that episode, Garth of Izar was depicted as a deranged, murderous insane asylum prisoner and did not exhibit the characteristics of the model Starfleet captain portrayed in Axanar. Interestingly, although Garth of Iznar is the focus of the Axanar film, the district court avoided any analysis of the copyrightability of this character. At present, the case remains open on the court’s docket. But JJ Abrams has announced that the suit will be dropped. Stay tuned. A huge thank you to Robert Uriarte for his help preparing this article. Previous articleHow Did Ma and Pa Kent Adopt Superman? Neel Chatterjee is an intellectual property litigation partner in Goodwin's Silicon Valley office. He is considered one of the nation's leading trial lawyers for complex technology and Internet disputes. Neel is well known for handling cutting-edge legal issues that break new ground in uncertain areas of the law, and is considered a thought leader in Internet law, patent law, and trade secrets law. Neel has handled many high profile cases, including one that was made into an Oscar-winning feature length film. Neel has obtained anti spam judgments in the hundreds of millions of dollars, has litigated many cases related to online liability (such as, whether someone can sell a duck on eBay), and has handled cutting edge patent dispute. In the late 1990's, he was a key person combatting online piracy of Star Wars Episode I: The Phantom Menace. He has also advised numerous people and websites on intellectual property rights related to the development and use of Fan Fiction. Nearly every ranking organization in the legal profession and numerous bar organizations consider Neel a leader in intellectual property litigation and Internet law. In 2014, Neel was awarded the IP Vanguard Award from the California State Bar and was also named an IP Trailblazer and Pioneer by the National Law Journal. He is currently awaiting nominations for People's Sexiest Man Alive. Neel is a major fan of Star Wars, Star Trek, and a wide variety of superhero movies. His favorite Star Trek Episode is "Space Seed" because it served as the basis for The Wrath of Khan. While it may not be obvious, he is also very handsome.